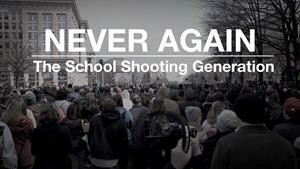 KARE 11 Debuts Breaking the News Special "Never Again: The School Shooting Generation"
MINNEAPOLIS, Nov. 08, 2018 (GLOBE NEWSWIRE) -- KARE 11 announces the premiere of Never Again: The School Shooting Generation, an investigation into the post-Columbine movement of students marching for their lives on Breaking The News on Friday, November 9, 2018. The TEGNA-produced special follows a group of student activists from the classroom to the Capitol, determined to not let school shootings become routine. "The special shines a meaningful light on the lives of students in-and-around our nation's capital as they've marched, rallied, cried, lost, and persevered," comments Stuart Boslow, Director of Content at KARE 11. "Friday's show will explore what students and families can do to reverse the trend that is impacting students and families in Minnesota and in every community across the country." "Hearing directly from those who walk the hallways is critical in understanding the heartbreaking new normal," said Breaking The News Anchor, Jana Shortal, "but seeing what they make of the new normal takes you from heartbreak to hope."